Each room at Boomerang Hotel includes modern interiors and a flat-screen TV. All rooms come with a fridge, and bathrooms are fitted with slippers. Located in Odessa City centre, just 1 km from Odessa Train Station, Boomerang Business Hotel features free Wi-Fi and a 24-hour reception. 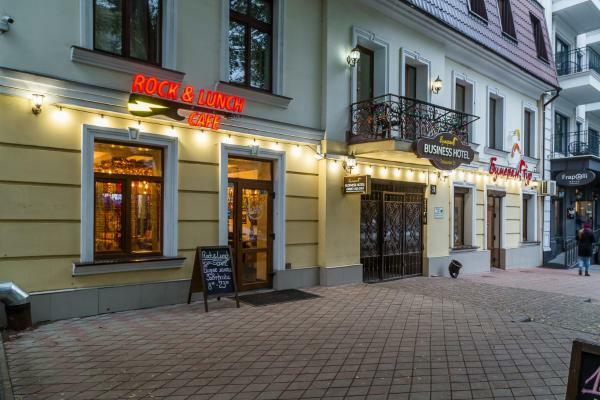 The famous Deribasivska Street is 10 minutes' walk away. The Potemkin Stairs and the Sea Port are 1.5 km from Boomerang Business Hotel. The 19th-century Saint Trinity Cathedral is just 2 minutes' walk away, while Odessa Airport is 7.5 km from the property. A range of cafes and restaurants can be found within a 5-minute walk of Boomerang, and breakfast can be ordered in the rooms. This air-conditioned suite comes with a flat-screen TV, fridge and wardrobe. Features a seating area. Air-conditioned suite with a flat-screen TV and fridge. This suite features a seating area. Air-conditioned suite with a flat-screen TV and fridge. This suite features a bedroom and a living room with a sofa bed. Air-conditioned room with a flat-screen TV and fridge. Horrible smell of cigarettes in the room! This ruined the whole stay! Entering the room we were told that now all will wear off, but the smell of cigarettes was everywhere, by the evening the smell was bad, but the staff shrugged and said that nothing can help (the hotel says that it is for non-smokers). Money refused to return. Changed room the next day. While all rooms have been renovated purely symbolic, hidden cracks in the walls, the lid on the toilet off, shower not working. The room that we replaced was good but much smaller than the previous one. The difference in price no one has returned, an apology, compensation or any compliments for such a horrible stinking room, too, was not. NEVER recommend to stay there. Because the problem was never fixed properly and quickly! You will shrug and say "hotel policy doesn't allow this", while the rooms are not cheap! And yet the hotel was renovated, the building materials were scattered on the aisle and everywhere was dusty (room was clean). The home cooked Breakfast — scrambled eggs or omelet, sausage, juice (tea, coffee). The hotel location is great and it's only a plus! I had not rest, and sheer frustration. Hello, it is very difficult to write a review about a place where was not, but not this time. Previously booked the room through the well-known Bukit platform, where the FREE CANCELLATION was written, I canceled the reservation 1 month before the arrival because some Koldorar Elena as it turned out later FOP hotels trying to withdraw the entire amount of the next day without Call, without a thought, and this is 8000 UAH, about it that it has to do with the hotel I learned later. In the bank I was informed that now there are such sites that are enough to know the number of the card, without expiration, etc. And they can withdraw money from the account, but it is illegal, after which I called the administrator he apologized offered to book me this room, but Make a prepayment of about 1000 UAH, I refused it once again apologized I thought of it all, it was approximately in the 20th of May, reservation on June 24. Exactly 20 days before the scheduled, and after the canceled check-in my card again trying to withdraw funds, call the administrator, he said that in the conditions of refusal is charged 100% prepayment and that now so on Bellagio and written and that I will not prove anything, anyone law on Rights of consumers he does not know the lawyer they do not have and and. T. D. And T. P.
The staff was very helpful. The hotel was very nice. Good repair. Price also pleases! Good day! Was passing through Odessa! Stayed at this hotel, I'm such a horror saw for the first time in my life! Dirty to horror, and when I came back from a walk and turned on the light, there is a huge tatarchani I saw for the first time! I go there even for free would not go! Stayed for one night. The rooms match the description. Except that the standard is not very large and there were nuances of the type of the non-working remote from the TV, but they were quickly eliminated. Previously allowed settlement and later eviction-without surcharges. Friendly staff. Great location. All major points of the city are accessible by foot. Full cleanliness. Orthopedic Mattresses. Good linen and towels. Slippers, tea set and kettle. Very satisfied. Would definitely come again. Compared to next door hotel frapolli21, this is no 1 star hotel. Gave better review because of good stuff. Old beds and pillows. Better pay more and get 3 times better. Terrible doors and windows — letting all the noise inside. I went to work with a co-worker for a few days. The impression is very negative. Number. The room was clean, two people could not walk. The area is 8-10 squares, without considering the bathroom. The bed is terrible: cheap mattress, very soft, so it's impossible to sleep. The bed and the towels change every 2-3 days. Until I asked shoes. With shampoo, soap No one's watching, you have to ask. The plumber is in a bad condition: the toilet cover biased, the shower cabin is a separate horror: hose in two places leaking when you take a shower, cold water is dripping on your head. Tried to use the floor with an iron-live wire in four places, shocked. The iron board is covered with a towel, that is, there is no coating, there are metallic pieces that cover the towel. Breakfast. There's no kitchen. They can bring a bun, yogurt, tea, curds, oatmeal in the morning. But not all at once. The location of the hotel is very good, I think, she buys everything in the shop and brings her to the room in the morning. The spoons in the room are cheap, which oxidized in contact with the food. It feels like metal and oatmeal eat. The room was very clean and the staff was very friendly and helpful. The hotel is screaming. I'm not calling to go to this hotel. This review is my subjective opinion. Well, my colleague. Enjoy your vacation in Odessa. The staff were very friendly and helpful. The room was very clean and comfortable. I can safely recommend staying in it. Very friendly and courteous staff, new hotel in the city centre. Quality exceeds the price. All older children or adults are charged UAH 200 per person per night for extra beds.